As a young journalist, I’m discovering what it means to be a part of this industry and what role journalism plays or purpose it has in society. The Committee of Concerned Journalists is a group of journalists, publishers and academics focused on these questions, exploring journalism’s function and future. 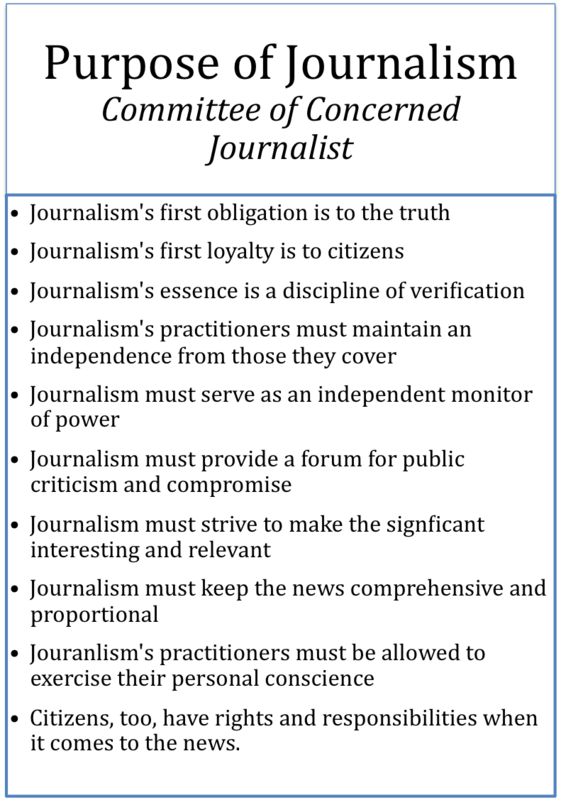 The committee has a statement of shared purpose, which outlines essential principles for journalists that have been created and shaped over time. These principles give me, a student, the opportunity to better understand the incredible opportunity I have to share the facts and stories that need to be shared with citizens, as well as some of the responsibilities and expectations that come with such a privilege. In a time when money is low and advertisers and shareholders have expectations for news organizations, it can be difficult to remember that reporting should be for the public good, first and foremost. In order to remain a credible source for breaking news and significant information, accuracy and fairness must be practiced and objectivity coveted. Over time, credibility has proven to garner a loyal, committed and diverse audience. Maintaining credibility can be particularly difficult within online news sources and the desire for the publication of breaking news, presented immediately. A rush to publish a story online may lead to the misrepresentation of facts, events or individuals. A study completed by the Reynolds Journalism Institute (RJI), which included interviews from 500 adults and 1,251 online newsroom editors, found that overall, both groups of individuals find that online news sites provide credible information. This trust in online news further emphasizes the need for journalists to ensure all information is accurate and factual. A transparent approach to the presentation of evidence is important. In 2007, Tom Rosenstiel and Bill Kovach, authors and journalists, published a book titled “What Newspeople Should Know and the Public Should Expect, Completely Updated and Revised,” which explores some of the important principles journalists should follow, including transparency. An important piece of this is establishing a standard process for verifying information, which will keep any biases, cultural or personal, from inhibiting the news stories produced. As a journalism student, this is the time for me to discover the most effective ways for verifying information, utilizing the knowledge of professors, seasoned professionals who can speak from experience. A balance of powerful storytelling and the inclusion of accurate, detailed facts can be difficult to come by when presenting the news. It can sometimes seem as though individuals are much more concerned with the latest celebrity scandal than issues like a possible budget shutdown or the state of affairs in Libya. As a college student, I find this to be true on campus. As a journalist, I have to discover how to take an important issue, topic or story and create a compelling story that individuals will want to read. These principles speak to the need for reporting to focus on the common good, reporting about events, forums and headliners that are interesting, informative, and factual for those reading the paper. As a student I am learning that it’s important to write on a variety of issues and topics, as well as presenting the news accurately and fairly.